I love technology and how it has helped made life east for man. Ever since the emergence of Mobile phones, aircraft, computers, e-commerce and other banking related software's and payment systems, life has been a lot easier. But the emergence of the d0ll as a technology has caused unrest and I think this may affect many relationships and marriages. It is as a result of this that the male doll was also invented. Ladies will no longer complain about one minute men, Innovators have offered them a solution. But a female twitter user who I have been following for some time now made some tweet regarding the dolls. "Check out the two, they are both big, but which one u want? Natural or rubber? 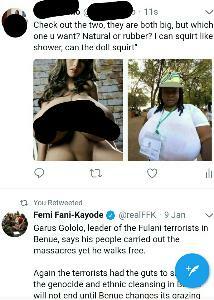 I can squ1rt like shower, can the doll squirt"
Well, to an extent she is making a whole lot of sense. There's is nothing like natural..